That’s why we create this brief guide, to let you know the best places that you must visit if you decide to visit Costa Rica this year. We hope this guide can help you decide the destinations and attractions that you want to include in your itinerary, but also, don’t forget to look over our best Costa Rica vacation packages. These ones have been prepared taking into account all the places you will find here, considering what you want to experience during your Costa Rica vacations. Most of the popular places to visit in Costa Rica can be enjoyed by everyone… The country has the perfect destinations to satisfy the needs and likes of children, seniors, couples looking for romantic escapes, families, solo travelers; but of course, we know that there are special places for special occasions, so we also include in this guide a small section of recommendations depending if you are visiting the country for your honeymoon, looking for a natural encounter or for having a good time of relax. The Poás Volcano National Park is one of the most visited attractions of the country thanks to its proximity with the San José city and the international airport. Its main crater is one of the largest in the world and the expedition consists of a hike to the crater rim. A visit to this active volcano can be done as a one day tour or as a stop during a transfer to other destination such as Arenal. Besides, it can be combined with a coffee tour to Doka Coffee Estate and a visit to La Paz Waterfall Gardens, which is a very good idea if you don’t have a lot of time in San José. ** There is an airstrip in Arenal used for domestic flights. A flight from San José will take you up here in 25 minutes . Located in La Fortuna Costa Rica, the Arenal Volcano National Park and its surroundings are full with a variety of conditions and attractions to please everyone. This means that it doesn’t matter if you are looking for adventure, relaxation or a nature encounter, in this region you can find a variety of hotels and activities suitable for you. Obviously its main attraction is the Arenal Volcano – a volcano that is currently in a resting phase – but the hot springs are also one of the wonders of this region. If you are looking for adventurous experiences, here you can enjoy of whitewater rafting tours, zip line tours, hikes, hanging bridges walks and a lot more; and after all that, you can simply relax in the hot spring pools while enjoying the incredible views of the volcano. Also you can treat yourself with a hot stone massage or a volcanic mud wrap in one of the incredible spas located in the hotels of the area. The weather in this region is varied, the annual temperature ranges between 21ºC and 28ºC and the rainy season goes from May to January, but it changes a lot during the day so we recommend you to be prepared for both, rainy and sunny days. There are two additional sites located near this region that we didn't want to leave out. One is closer from the Arenal Volcano and the other one is a little bit longer but worth the trip. One of the natural wonders of the country is without a doubt the Celeste River and maybe you have already heard about it, as it is one of the most famous places of Costa Rica. What makes it so special is the incredible light blue color of the water that seems to be artificially colored. To get here it is also important to have a good physical condition since the hike will last around 3 hours through the rain forest, more or less. It is no possible to swim in the river but getting to see this spectacular phenomenon is more than enough. ** There is an airstrip in Manuel Antonio used for domestic flights. A flight from San José will take you up here in 25 minutes. Here you can find, as in Arenal, zip line tours, whitewater rafting tours, snorkeling tours, fishing expeditions, hiking in the National Park, ATVs, and many more activities. Besides, we recommended this paradisiac destination in the Pacific region of Costa Rica as one of the best places to visit in December, since here you can enjoy incredible kayak tours in the sea or in an estuary, among other benefits of planning your vacations in Costa Rica such as a great weather and a cool beach ambiance. Something very important to know is that there are no all-inclusive resorts in this area, and the lodging here is mainly composed by small boutique hotels immersed in the forest, each one featuring its unique and characteristic style. The area is also well-known for its multiple places for dining out. Here you can find a wide variety of Costa Rican typical food and international cuisine, just for the delight of all its visitors. Nearest airport: The best way to get to Corcovado is taking an internal flight of 50 minutes from San José to the Puerto Jimenez airstrip, and from there, a boat ride that will take you directly to the park or the hotels nearby the park. A road trip from Juan Santamaria International Airport for example will take you more than 8 hours. You can always think about renting a car, but we do not recommend this option because you will lose some valuable time trying to get there by road, the driving distance is considerably huge. That’s why we always suggest to take a domestic flight to the area… You will save a lot of travelling time. Corcovado National Park was listed by National Geographic as “the most biologically intense place on Earth in terms of biodiversity" and that means that you will be immersed in one of the most amazing forests of the world. Here, of course, there are no roads. You have to take a boat to reach the small lodges and to the park and you will have no access to Wi-Fi or telephone signals. Corcovado is the perfect place to disconnect completely from the noise of the city. Besides these conditions, the lodges of this region offer rustic-but-luxurious experiences, always focused on personalized services and knowing that if you decide to visit this part of the country is because you really want to live a different experience, one that you rarely will find in another part of the world. Another important thing to take into consideration is that here, the weather conditions are extreme during several months. There are some months such as September and October where most of the lodges are closed due to the rains… an important fact to consider if you are planning to add this amazing adventure to your vacations in Costa Rica itinerary. Nearest airport: There is no way to get to Tortuguero by land. An internal flight from San José to the Tortuguero airstrip will take you up here in 30 minute. Besides, you can choose a road trip of 3 hours approximately and after that a boat ride through the canals of the Tortuguero River for about 2 hours approximately. Recommended for: Family vacations, wildlife and nature lovers. Tortuguero is a unique destination a jewel among the lush green of Costa Rica. This National Park is a set of water canals and it is locally known as the Amazonas of Costa Rica. The best way to reach the town and the hotels of this destination is by boat, but you can also take a domestic flight. We recommend you to do at least one way by boat, since the ride throughout the canals is not a simply transfer but an amazing expedition in which it will be possible to see a lot of water birds, monkeys, crocodiles and the lush flora. One of the best experiences that you can enjoy in the area is the turtle nesting in Costa Rica. Every year from August to October, it is possible to see the nesting of the Green turtle. Tortuguero is a paradise for the turtles to come and nest their eggs, in fact, that’s the reason of its name. This experience is something that you and your family will never forget, so be sure that you don’t miss this tour if you visit this part of the country on those dates. Nearest airport: Juan Santamaria International Airport (SJO) – 161 km, 3 hours and 40 minutes approximately. Driving to Pérez Zeledón. ** There is an airstrip in Pérez Zeledón used for domestic flights. A flight from San José Costa Rica will take you up here in about 30 minutes. To get there, most people drive through the locally known “Cerro de la Muerte”; the highest point of the Inter-American Highway. Recommended for: Adventure, hiking tours, nature lovers. Chirripó is one of the Costa Rica’s wilder national parks. Despite the fact of the climate and the lush vegetation that make it so wild, the park is accessible by walk. The only thing about it is that you have to be in good shape to hike through this mysterious park. The park is located in San Isidro del General, encompassing parts of three provinces of the country: San José, Cartago and Limón. The area was stablished as national park in 1975, in order to protect the great biodiversity of the area, which constitutes a fascinating spot for biologists, nature lovers and adventure seekers. This place is a must see if you love challenges and if you are having some Costa Rica vacations! 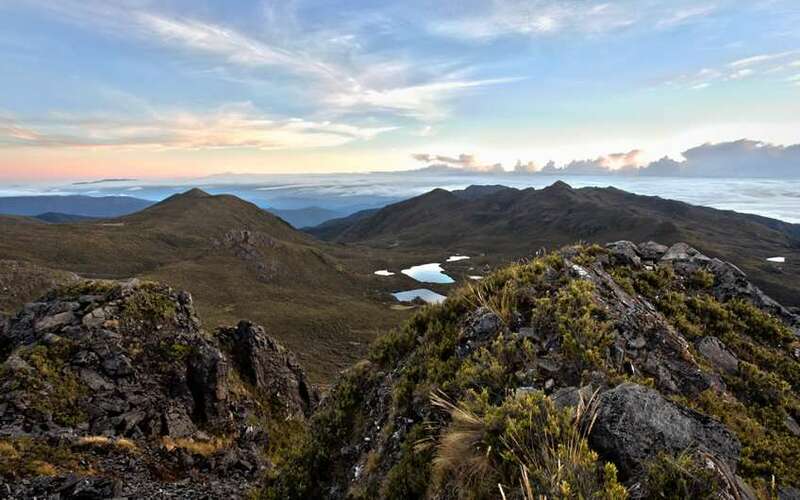 This National Park is Costa Rica’s highest peak, that’s why hikers find here a challenging adventure of hiking. Besides the challenge of conquering the Cerro Chirripó, there are a lot of trails that can be found in here travelling through a bunch of diverse ecological zones. Here, you can find more biodiversity that the one you can probably find in other entire countries. Here, at the highest point of the country, the views are incredibly spectacular, allowing visitors see both, the Pacific Ocean and the Caribbean Sea, at the same time on clear days. It is an exquisite delight for nature lovers and also for those who want to add an unforgettable experience to their Costa Rica adventure vacations. At Chirripó park headquarters you will find maps and guides available to help you enjoy in a better way your hiking experience. You must be prepared to experience an intense journey so it is a good advice to train previously to be prepared physically and psychologically to face the challenge of climbing the mountain. The natural landscapes will vary as you climb the mountain from the pastures which are located at 3,300 feet (1000 meters) of elevation near the town of San Gerardo de Rivas. Then, through the climb you will find the paramo landscape (also known as tundra ecosystem) near the peak, approximately at 12,530 feet (or 3,819 meters). If you are thinking about camping here, then you should know that this activity is not allowed here, in order to protect the ecosystems; but, you can find some shelters (locally known as “refugios”) where you can spend the night before starting your adventure to the top of the mountain. The first shelter is located at Llano Bonito, half way up. The second one is the main “refugio” and it is found about two kilometers from the peak. You can start climbing after spending the night here. The last shelter is located some few kilometers north of the Chirripó. There are other lodging options, you just ask us for the ones that are in and near San Gerardo de Rivas. ** There is an airstrip located in Tamarindo which is used for domestic flights between different destinations inside Costa Rica. A flight from San José will take you up here in 45 minutes, instead of the approximately 5 hours that will take you a road trip from the Juan Santamaria International Airport. Recommended for: Family vacations, beach vacations, surf vacations, diving vacations, all-inclusive vacations in Costa Rica. The Guanacaste beaches are known around the world, in fact, a lot of famous personalities have chosen this destination for their Costa Rica vacations or even some of them has their own houses here. The 200 km of the Pacific coast are blessed with amazing weather and clear waters that have become a perfect place for surfing, diving, fishing, horseback riding, swimming, or simply taking sunbaths. Tamarindo is a picturesque town with a great nightlife and an amazing surfing culture. This town has become also one of the most famous places for surfing; in fact, most of the Costa Rica surf vacation packages include this destination, since it is recommended for both beginners and pro surfers too. As we said before, there is an airstrip in this town that makes it easier to come in and out of this destination, but if you are arriving to Juan Santamaria International Airport, a road trip of approximately 3 hours will take you up here passing by incredible plains with the most beautiful landscapes. Here in Tamarindo you will find great accommodations, perfect for different budgets and also for different kind of visitors. The area also has a great nightlife ambiance, and it offers a variety of cuisines, ideal to spend a great time dining out. Here you can find a well-developed area, with lots of shops, stores, and fun for turn your vacations in Costa Rica into something memorable. The Papagayo Peninsula is one of the best places for diving tours in Costa Rica. This is not only a luxurious peninsula, where the best 5-star hotels of the Guanacaste Costa Rica beaches such as Four Seasons Resort and Andaz Papagayo Resort can be found, but also this destination is world known for the breathtaking diving spots it offers and its majestic views. If you are arriving to Juan Santamaria International Airport, a road trip of 4 hours approximately will take you up here. Or you can arrive to Daniel Oduber International Airport in Liberia Costa Rica, Guanacaste. Recommended for: Wildlife and nature lovers, volunteering groups, couples, and families. Besides this, Monteverde Costa Rica is a pretty amazing destination for adventure seekers too, because it offers night walks, zip line tours, wildlife tours, among others. Besides, Puerto Viejo beach has the best swell of the country, known as Salsa Brava. The beaches of this region are world known for being perfect for surfing and the surfing culture of this town is really masive. Combining Tamarindo and Puerto Viejo for example, is a perfect idea for a surfing vacation package in Costa Rica. Something important to consider while arranging your vacations to this paradisiac destination is that there are no large all-inclusive resorts here and most of the accommodations are small lodges, hostels, tents and hammocks. A completely different experience that you will not regret at all after spending some days in this part of the country. You will love the lots of nature and wildlife of the place. A lot of volunteering groups of students and scientists visit this destination to do researches of flora and fauna. Nearest airport: Juan Santamaria International Airport (SJO) – 68 km, 2 hours and 40 minutes approximately, driving by car. Recommended for: Hiking tours, nature lovers, photographers. Irazú is one of the Costa Rica’s active volcanoes. The volcano is open to the public and it is located in the Central Mountain Range, in the province of Cartago. Its name comes from the combination of ara (point) and tzu (thunder) as a corruption of the indigenous word Iztarú, which also was the name of the indigenous village that existed on the flanks of the mountain. The volcano is the highest active volcano in the country, but it is important to mention that its “activity” doesn’t consist in throwing lava or some gases, it is active because the geologists have identified underground activity during several years. From the top of the volcano, it is possible to see both oceans, Atlantic and Pacific, on a clear day. However, this days are rare because the volcano’s summit is almost always covered by a lush amount of clouds. Now you can figure it out how cold this place is! The forestation of the place contains both primary and secondary montane forests, thanks to the altitude and the fresh climate. It is not very common to find fauna in here, easily visible for tourists I mean, but the volcano is home to foxes, owls, rabbits, hummingbirds, armadillos, and woodpeckers, as well as varied insects. If you are coming here during your Costa Rica vacations, then let me tell you that you will be able to see the main crater when it is not covered by clouds, and you will also be able to take some great pictures of it, but you may know that it is forbidden to walk inside the crater, in order to keep you safe and avoid any accident. The Irazú Volcano has made several eruptions through the years -at least 23 times since the first one that was historically recorded-. But, the most famous of them was the eruption that began on March 19, 1963 and continued until 1965. However, you don’t have to worry if you are including this one-day tour in the itinerary of your Costa Rica family vacations, the last eruption was registered in 1994 and lasted only one day. It is a great option to spend the day as you can learn a little bit of natural history while being there and the path is easy to walk and enjoy. The visit is ideal for any member of your family. As you start your journey towards the volcano you will see some fields where local farmers produce potatoes, onions, cabbage, among other local products, and that turns the crossing into a very nice and pleasant tour. The landscapes are beautiful and you will certainly appreciate the views. The National Parks counts with the vigilance of the personal of the red cross, clean and nice bathrooms, and a cafeteria with a small souvenir shop. You will surely want a hot cup of coffee or chocolate after you finish your walk. But, if you don’t want to eat there, then you just have to drive back to Cartago and you will find a great variety of small sodas to eat as well as some well-appointed restaurants with local and traditional cuisine and international dishes. And, if you truly want to live and experience a visit as a local, then you can buy some bread and pastries sold on the street by local people. They can offer you some fruits, veggies, and cheese. Undoubtedly, a great opportunity to taste the local flavors and know more about the culture of Costa Rica. Just as a curiosity, at some point in the middle of your way up to the volcano, you can watch to your left and you will see a big property of various buildings with an aspect of being abandoned… this is the locally known Sanatorio Durán. This placed used to be a hospital (Sanatorio Carlos Durán of Tierra Blanca de Cartago) for tuberculosis patients founded in 1918, and which functioned during the first years of the 20th Century. Around this building there are a lot of stories and legends that enriches the local culture of the Costa Rican population. You can pass by if you are curious, but we warn you that it is not a nice place to stay, as there is only the building and commonly there are crowds of visitants. If you want to know more or visit this imposing volcano, then contact us! We will be more than glad to assist you with information and more details. Nearest airport: Juan Santamaria International Airport (SJO) – 87 km, 2 hours and 50 minutes approximately, driving by car. The Turrialba Volcano is an active volcano located in the Central Valley of Costa Rica, specifically in the Cartago province, as well as the Irazú Volcano. This volcano used to be an attractive point for hiking down to the main crater but its recent seismic and volcanic activity forced the park to be closed. The volcano has had at least five big eruptions in the last 3500 years. The volcano has three craters in its summit, the largest one has a diameter of 50 meters (160 ft.) and there is a montane forest and montane range below this summit featuring some species of bromeliads, lichens, ferns, and mosses. Most of this forest is primary and secondary which allows small wildlife to be around. As we mentioned before, Irazú Volcano is very close to this one and both are considered among the country’s largest volcanoes. In this volcano, it is also possible to see both the Caribbean Sea and the Pacific Ocean when the day is clear. And, if you are lucky, you can spot other volcanoes such as the Barva and Poas. The volcano’s most recent volcanic activities were a series of eruptions occurred on March 12th, 2016 that were so expansive and resulted in the suspension of the activities and flights of the San José international airport, the Juan Santamaria. This eruption spewed a considerable amount of ash throughout the Central Valley during days, and affected a great part of the population. The active Turrialba volcano erupted again on March 13th which forced the airport to remain without operations. As this airport was closed, the big part of the flights was made from the Daniel Oduber Liberia Airport, which helped a lot with the influx of passengers. Using terms of geology just to describe the characteristics and magnitude of these eruptions, we have to say that those ones were phreatic (which means that the activity included gases, ash, and some mud too) and strombolian (which means that magna were also involved in the event). During those days, the ash reached the surrounding areas of San José and also affected part of the provinces of Alajuela, Heredia, and Limón. As its name refers, the volcano is located in the city of Turrialba. This town was once one gateway to the Atlantic coast, with a great importance for the transportation of the materials, products, and workers travelling to and from this area. Nowadays, the area of Turrialba is the starting point for many great activities and you can find a variety of accommodations and restaurants or sodas as you pass by during your trip. Adventure tours can be taken here and it is common to find great opportunities to be in close contact with nature. It is important to mention that Turrialba is actually recovering from the ash fall that affected their plantations and other touristic activities in the past months and this is one of the reasons the town offers relatively little in terms of services. 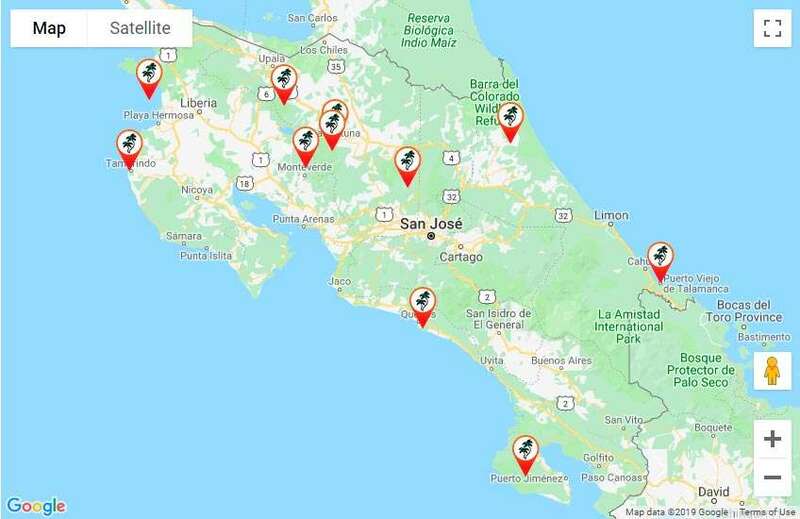 However, if you want to visit the area and know a little bit more of it you can include some tours during your Costa Rica vacations, just be sure to have a 4WD vehicle if you plan on accessing the park on your own. Nearest airport: Juan Santamaria International Airport (SJO) – 82 km, 2 hours and 20 minutes approximately, driving by car. Recommended for: Hiking tours, nature lovers, history. Guayabo de Turrialba is an archeological place located in the area of Turrialba, within the Cartago province and the Central Volcanic Conservation Area. This site has a great archeological importance, as well as cultural too due to the fact that it is the largest and most important site of this kind in Costa Rica. The richness of the area in terms of history is unimaginable, even though only a very small part of it has been studied and uncovered. The monument can be found in the southern slope of the Turrialba Volcano and covers approximately 232 hectares (574 acres). Its real significance is still unclear, as the settlement was occupied by natives between 1000 BC and 1400 AD, after which it was abandoned in mysterious ways and none recorded anything before the ruins were founded. It is believed that Guayabo was an important center for cultural, religious and political activities, but the specific details about its importance have yet to be discovered. Most archaeologists believe that the city was a key center of importance for the neighbors’ governments of the time. If you came to Guayabo, then you will find an array of stone paved streets and round platforms which were supposed to be the basis of several wooden structures. You may also find the residuals of aqueducts, carved stone designs, ponds and some animal’s drawings. During an excavation made in 1891 there were found over one hundred relics that were resituated and exposed at the Historical American Exposition held in Madrid in 1892 and the Chicago’s World’s Columbian Exposition, in 1893. The site was declared an International Historic Civil Engineering Landmark in 2009, by the American Society of Civil Engineers. This society recognizes the accomplishments and the techniques of engineering made by the first inhabitants of Guayabo that has endured over the time to be the structures known nowadays. This national monument in Turrialba sits on only an approximate of 10% of the total area while the other 90% is premontane rainforest. Due to the location, it is not very common to find large amounts of wildlife, but squirrels, armadillos, coatis, frogs, lizards, snakes, and oropendolas can be spotted. If you want to know a little bit more about Costa Rican culture, then you can visit the Guayabo National Monument during January through April, as they are the best months due to climate conditions. To get here, the easiest way (and the highly recommended one) is to arrive in a private transfer with your naturalist guide, but if you prefer to travel alone, then you can use the public transportation from Turrialba to Guayabo village or renting a car can be a good idea as well. If you want to spend part of your vacations in Costa Rica here, then let us know that the monument is open from 8 am till 3:30 pm and has basic facilities. The weather here is comfortable, reaching approximately the 18°C during the day and the strongest rains runs generally during September and October. It is recommendable to wear shorts or a fresh pair of pants, comfortable T-shirts, appropriate shoes for hiking, sunblock and sunglasses, and rain gear or light coat as the weather is unpredictable. If you like historical tours with a little bit of mysticism and energy, then this place will be a good option to add into your Costa Rica vacation package. Nearest airport: Juan Santamaria International Airport (SJO) – 49 km, 1 hours and 40 minutes approximately, driving by car. Recommended for: Nature lovers, families, botanical interests, ecotourism and sustainability. If you want to spend differently a part of your day, then you must visit the Lankester Botanical Gardens of the University of Costa Rica. 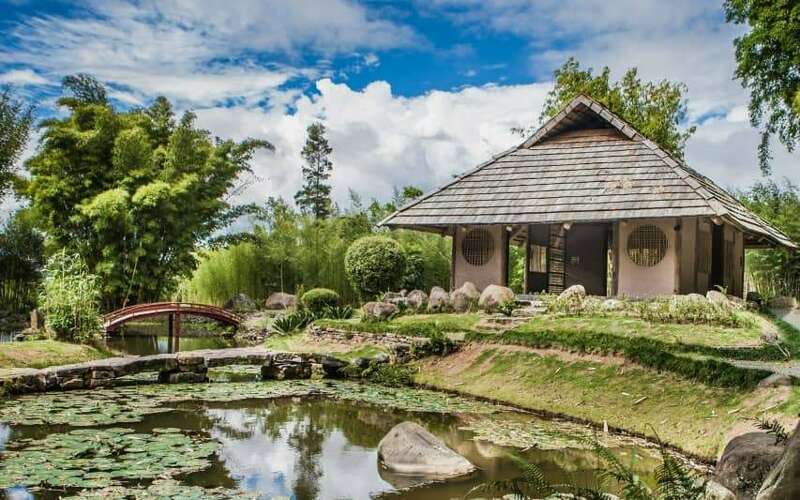 This place is a set of different gardens located in Paraíso de Cartago and, despite it is operated by the university, the doors are open to the public. This garden was originally created in the 1940’s by the well-known British orchid enthusiast, Charles H. Lankester, as a private garden, but after his death, the Stanley Smith Horticultural Trust and the American Orchid Society preserved the gardens. Nowadays, this scientific center is one of the most important and active botanical research centers in the American tropics. The center contact specialists from all around the world in order to help them in the labor of identify species, study hypothesis, and ask for guidance in the topic. It is considered as the center responsible for most of the description of around 1600 species recorded in Costa Rica, and the number recorded to date is increasing at a rate of 20 new ones per year. As an interesting fact, it is expected that their catalogue of species will increase till the number of 2000 species, although it can easily reach the number of 2500 types of species, thanks to the great diversity. The researchers of the Lankester Botanical Gardens are specialized in the orchids of the American tropics but lately they are expanding its investigations to the Brazilian, Guyanese, and Andean species, in order to have more knowledge about this kind of flora. We can proudly say that the Lankester Botanical Gardens developed their own work and research method, and that this is currently used by scientists through the Latin American region. The garden is a direct collaborator of the National System of Conservation Areas (SINAC), which is in charge of protecting the Costa Rica wildlife refuges and national parks, among other systems in which flora and fauna are involved. They work together in order to preserve and study the local species found in the protected areas of the country. Lankester Botanical Gardens is involved in sustainable projects that enhance the natural resources of the country at the same time that offers great opportunities for both, researchers and visitors, of improving their knowledges and enjoying the natural beauty of Costa Rica. The place is ideal to be included in most of the family vacation packages to Costa Rica, as it will be a joyful learning experience for the delight of all the family members. The property is beautiful and you will also find a souvenir shop in case you want to leave with a present for your beloved ones. Here, you will also find a deck with chairs and tables to eat something with a nice cup of coffee after your experience in the gardens. Just contact us in case you want to know more! Love this article. Pretty accurate. I used your advise while travelling there in September 2016. Arenal volcano is beautiful. White water rafting is amazing. I 'll go back there for rafting. I read your article and I must say that your shared all these places are the perfect as traveling point of view. Corcovado National Park is also famous destination and my favourite too. I had incredible time there before mine Tour Bus when I was visited this most amazing an adorable park. I really enjoyed there hiking and photography. It is a best place for outing and I will love to go there again in my free time for having enjoyment. Manuel Antonio National Park is a most adorable and lovely destination for visit around the world. I had remarkable time there before my tours bus with my friends during my holidays. We all had huge fun there through different activities like hiking, camping and photography. It is a best place where you can enjoy some time with family and kids.